Plus, I want to keep up with these posts because I find that they are little digital memory keepers for me and so fun to look back on. These last few weeks I've got spoiled (and so has the little one) with showers, gifts, and lots of love! My in-laws got this cake for the family shower--isn't it adorable? Jesus. Paid. It. All. Amen. 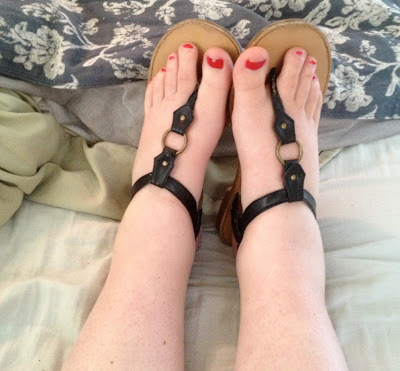 Not only have the cankles/swollen feet made an appearance, but they have now become a bit over the top (literally). In fact, I wore flip flops (like the ugly foam kind!) to work all week because I l could not get my squeeze my feet into any other shoes. I definitely felt weird wearing flip flops with dress slacks :) Of course, today, when I don't go into work, my feet look perfectly normal. Oh well! I baked bread. It was therapeutic. Plus, it smells good. After I fell, I had to sit in bed all day (doctor's orders) so I worked on a little something for the nursery. The nursery is about 95% done, and I can't wait to show it to you! My sweet parents sent me get-well (don't fall again!) flowers. Oh, there's me--with my diaper ice pack. Thankfully, my bruises are almost gone! We've been trying to soak up these last few weeks of quiet and undisturbed mornings. I know they'll be a lot harder to come by in a few weeks. My sweet man got me some tulips for my birthday and I'm still looking at them! Don't tulips make it feel like Spring? Oh, and there is my sweet pup who has no clue that his little life is about to be majorly disturbed. Any ideas to help make the transition a little less stressful for him (which makes it less stressful for us!)??? I hope that you all have a great weekend! !